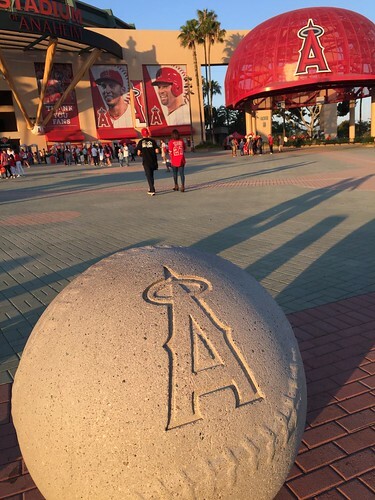 It's L.A. (okay, Anaheim), which means you probably have to drive (-1), but there is a lot of parking around the stadium (+1) and it's extremely cheap (+2). There is a train you can take to the game (+1), but it's barely cheaper than parking (-1). 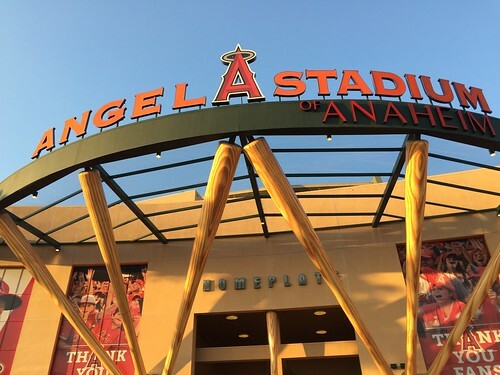 The Angels have the most affordable tickets in baseball (+1), which is especially great given the prices of everything else in Southern California (+1). Seats in the upper deck can be had for less than $20 (+1), and the view isn't too bad (+1). There can be some seats where you can't see parts of the field (-1), but for an older stadium there are not many obstructed view seats (+1). The exterior of the park has a distinctive Southern California feel (+1). There are palm trees all along the park (+1) and lots of other greenery (+1). The park's tan concrete fits the style of the area (+1), and the exposed green steel is emblematic of classic baseball stadiums (+1). The homeplate entrance has a to-scale baseball diamond that lights up and night (+1). The large Angels helmets are kind of weird, but definitely unique. A large "A" that was part of the original scoreboard is way out in the parking lot (-1), but lights up after the team wins (+1). The interior architecture matches the Southern California feel of the exterior (+1). There is a pretty cool rock waterfall in the outfield (+1), and you can see the game all the way around the main concourse (+1), even though you can't see it from the upper or lower concourses (-1). There are photos of current and former Angels players everywhere throughout the stadium, including some of their childhood photos (+1). A bonus point for Mike Trout's return from an injury for the game I attended (+1). The scoreboard has all the stats you could ask for (+1), but the video is smaller than the ads on the scoreboard (-1) and definitely not on par with some of the newer video boards in the majors (-1). The out-of-town scoreboard in the outfield is fantastic, though, and shows every game in the majors at the same time (+1). 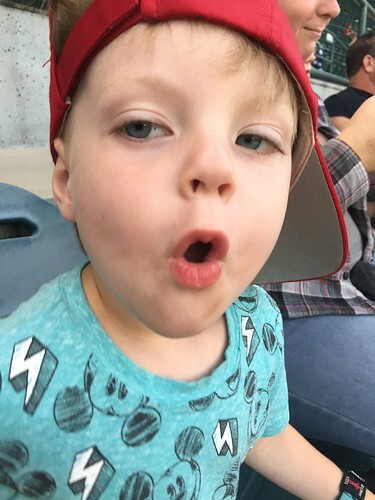 There isn't much to do for kids in the stadium (-1). In fact, they used to have games for kids in a kids area, but got rid of the majority of it in the most recent remodel (-1). You can see the Disneyland fireworks during a night game (+1), though, and they do let kids run the bases after Sunday afternoon home games (+1). 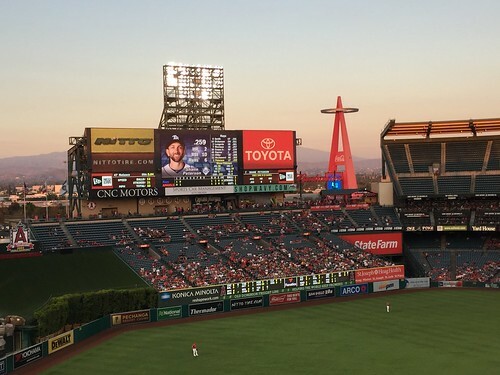 The Southern California fans are pretty laid back (+1), but Angels fans know their baseball (+1). The stadium isn't usually packed, however, (-1). It can also get kind of quiet in the stadium (-1), but the Rally Monkey tends to spice things up and is actually less annoying than I thought it would be (+1). The ushers are as laid back as the fans (+1), but they are incredibly helpful (+1). They don't patrol every aisle so it is simple to trade up to great seats (+1). One of the benefits of the sparse attendance is the large number of empty seats you can trade up to (+1). Angels fans sing "Take Me Out" during the 7th inning (+1). They then play "Build Me Up Buttercup" by the Foundations. It's a strange choice as, even though it's a catchy song (+1), there is no connection to California (-1). The Rally Monkey videos in the later innings when the Angels don't have the lead are hilarious, though (+1). They will put the Rally Monkey into famous movie clips, and it works well to engage the fans (+1). There is absolutely no where to go outside the stadium without making a perilous journey across a freeway (-1). There is a tent city just outside the stadium you could go to (-1), but it's not really the best post-game atmosphere (-1).